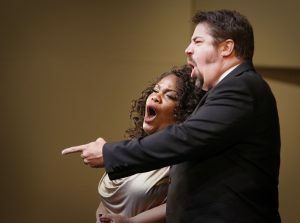 Alumni Latonia Moore and Joel Burcham sing a duet from Cavalleria Rusticana at the 2014 gala concert celebrating retiring general director, Jim Swiggart. Every year, Opera in the Ozarks offers master classes with experienced singers, movement coaches, and stage combat. In addition, a series of faculty-led seminars on topics such as the business of opera, recitative singing, and other topics are often scheduled during the last few weeks of the program. 2018’s guest artist teachers were George Shirley, Rebecca Sherburn and Inspiration Point alumna Nina Hinson. In recent seasons, master classes with Mignon Dunn, Melanie Sonnenberg, Robert Grayson, Stephen West and distinguished OIO alumni Latonia Moore, Maria Kanyova, Andrew Stuckey, Joel Burcham, and many others have excited our students and provided valuable insight into vocal performance careers.